A few years ago, I was looking for a way to help manage my stress. Several of my friends are self-proclaimed yogis so I decided to join them for a class. I have been hooked ever since! Yoga is great for both your physical and mental health. My older daughters have been hooked for years. My youngest fell in love with it when she took the class as an easy elective her senior year. In Boca, there is plenty to choose from, both on and off campus. 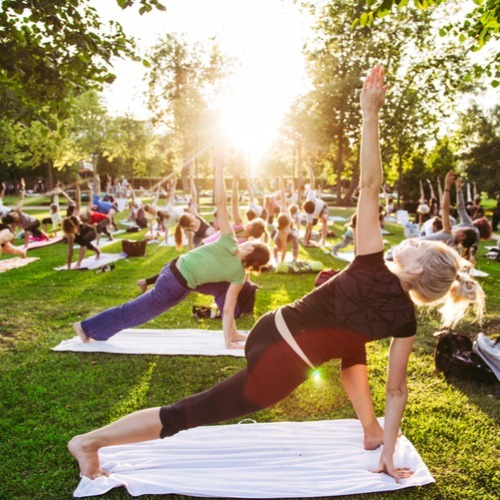 Yoga Group Fitness: Connect your mind, body, and spirit in this fitness-based class! This class combines Restorative and Vinyasa techniques. Classes vary in length from 50, 60, and 75 minutes. This class is offered at both 1 and 5:15 pm. You can even take a yoga class for one credit (PEM 2121). The course is designed to introduce students to yoga including the theory and physical practice of body position, breathing and meditation. It meets twice per week and is a 50 minute class. My daughter needed an easy elective to go with one of her most difficult semesters and decided to take this class. Yoga Journey: Located at 1950 Glades Road, They sell single classes for $10 and offer class packages ranging in price from $50-$250 depending on how many classes are in the package. They also have an outdoor class on Saturday morning in Mizner Park for free. Yoga Aura: located at 2910 N Federal Hwy B, Boca Raton, FL 33431. Yoga Aura offers a variety of classes to fit all levels. First-time visitors can purchase a 10-day pass for $30. Students can purchase unlimited packages for $79 a month or pay $14 per class with a valid student ID. They also offer equipment rental and a Juice Bar. Yoga South: located at 3500 NW Boca Raton Blvd #731, Boca Raton, FL 3343. Yoga South offers over 9 different classes with varying skill levels. Students can purchase single classes for $14 and unlimited monthly packages starting at $128 with valid student ID. They also offer access to an infrared Sauna for an additional cost. Keshava Radha Yoga Inc: located at 1700 N Dixie Hwy #142, Boca Raton, FL 33432. Keshava Radha Yoga offers new students an introductory rate of one-month unlimited yoga for $39. Defy Gravity Yoga: located at 5821 N Federal Hwy, Boca Raton, FL 33487. Defy Gravity exclusive offers Aerial and Fitness Classes. A single session is $30, first-time visitors get their second class for free. They offer several class pack options and unlimited monthly membership begins at $159.00. Make sure you check Groupon as you may find special pricing on other studios or even the recommended ones.